The Scottish Society of Photography has been publishing writing on photography for over thirty years. During this time we have built up a substantial archive of articles and reviews. This feature, the first in a series that looks to give a new lease of life to many of those articles, is by A.D. Morrison-Low and was first published in the Spring 1987 edition of Scottish Photography Bulletin. 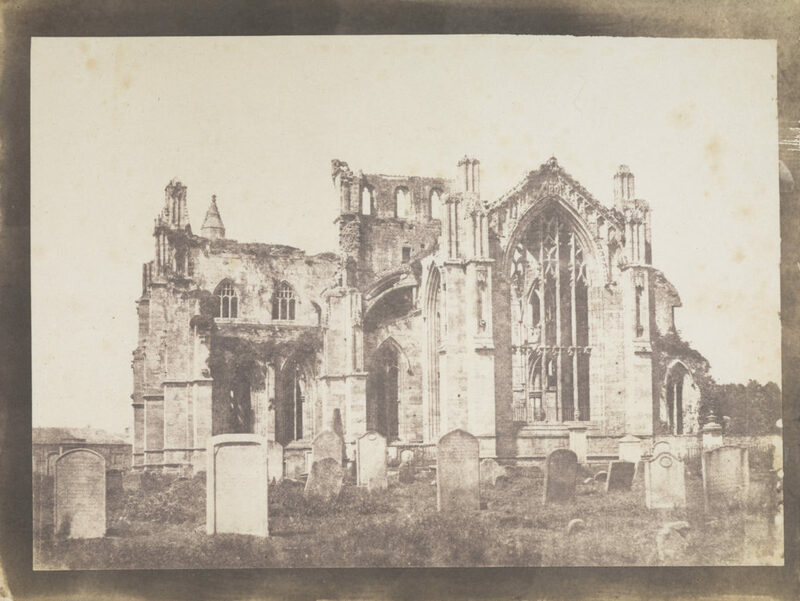 It’s publication came shortly after the National Galleries of Scotland had acquired a generous gift of some 900 calotype negatives and positives from the descendants of John Muir Wood (1805-1892)1. John Muir Wood came from a musical family; his father was a maker of musical instruments while he himself and his brother were music sellers and publishers based in Edinburgh. Wood himself moved to Glasgow in 1848, where he founded his own firm2. In his youth he received musical tuition on the Continent, in Paris and Vienna, and besides becoming a competent linguist he formed a wide circle of acquaintance. Throughout his life he was evidently much struck by beautiful scenery, and he seems to have taken up calotyping to try to capture on paper what he saw on his travels, although he is not known to have attempted either sketching or painting. John Muir Wood appears to have taken up photography during the period 1843 to 1845, but it is not known whether he was self-taught or learnt from someone; he was certainly an experienced photographer by the time he visited Belgium in 1847, from which trip many calotypes survive, some of the earliest taken in that country3. The invention of the calotype coincided with a period when he had no family responsibilities – he did not marry until 1851 – and was financially supported by an expanding concern, run primarily by his very competent brother. His diary for 1847 gives a brief account of his journey to Belgium with some details of his calotype activities, and the surviving prints give some indication of his ability. However, with increased business commitments and family ties he seems to have abandoned photography as suddenly as he had taken it up. The calotypes themselves are of excellent quality and variety. Wood photographed both landscapes and portraits, and took his camera with him on his considerable travels. In the collection there are early images, not just of Scotland, but of various places in England (and at this stage it is difficult to assess which of these calotypes were taken by Wood, and which were being sent to him by friends; there are a dozen images of Bristol, for instance, known to have been sent to him by Hugh Owen), and of Ireland, France and Germany. Curiously, he appears to have been working outside the ‘mainstream’ of Edinburgh photographic life; he was not a member of the Photographic Society of Scotland, and as yet there is little to connect him with Hill and Adamson or their circle (although Miss Stevenson tells me that D.O. Hill owned a piano …), and in appearance his images bear more resemblance to those of Talbot, in structure and more especially in the colour ranges. Indeed, Wood photographed many scenes reminiscent of those used by Talbot for his Sun Pictures of Scotland; the difference being that Wood’s images of Loch Long, Tighnabruaich and the Kyles of Bute were places that he visited and happened to take his camera, rather than deliberately setting out to photograph a particular view. Even so, forty-four different shots of Melrose Abbey might strike one as pretty tenacious! Wood kept a diary intermittently between 1835 and 1847 recording details of his tours through Scotland and abroad. The only clue to his understanding of chemistry, which emerges in the technical excellence of his photographs, is noted in September 1837. On his way to a music festival in Birmingham, he stopped off at Liverpool for two days where he attended the medical sessions of the British Association for the Advancement of Science. He also saw a Dr R.D. Thomson on three occasions during the two days, perhaps to obtain his professional advice. 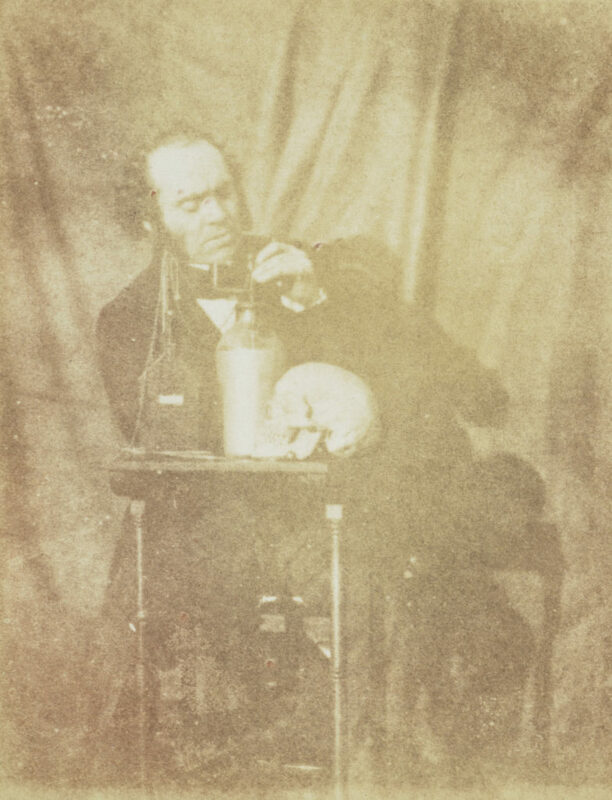 The close relationship between the medical profession and photography was especially strong in Scotland, where an excess in the number of trained doctors meant that there were men with chemical knowledge and leisure to pursue a difficult art. 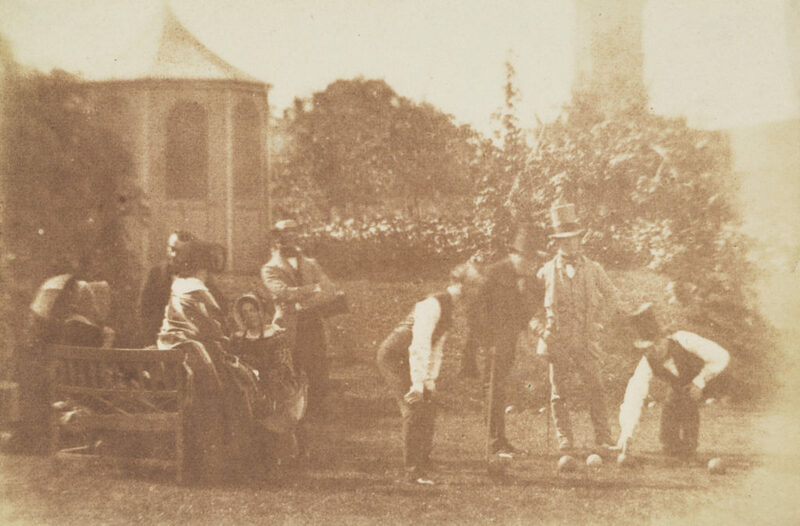 Like Hill, Wood seems to have had the rare ability to persuade his friends into relaxed poses; the bowls party reveals a delightful vignette of a warm summer’s day in a certain stratum of Victorian society. Dr Jasper MacAldin is deeply engrossed in an electrical experiment, in which he is about to connect the wires leading from the thunder house to the Leyden jar; the Leyden jar stored static electricity, while the thunder house was a demonstration device designed to illustrate on a small scale the effect of lightning on buildings: dramatic collapse. Jasper MacAldin was a medical student in Edinburgh from about 1826 to 1831, when he became a Licentiate of the Royal College of Surgeons of Edinburgh. (One is reminded of another near contemporary of his, John Adamson of St Andrews, who had obtained the same qualification from the same institution in 1829; perhaps they knew one another.) MacAldin subsequently went on to obtain his M.D. in Berlin in 1836, and was thus in Germany at the time of Wood’s visit in 1835, although no meeting is mentioned in Wood’s diary. MacAldin became a Fellow of the Royal College of Surgeons of Ireland in 1844, and by 1861 appears to have been resident in Coleraine, County Londonderry, for a number of years. Among his interests, he lectured on ‘Electricity and Galvanism’ – as illustrated in Wood’s calotype – and ‘Chemical Properties of Light’. This suggests that MacAldin may have been the link with the (as yet) unidentified person who taught Wood photography. The predominance of landscape images in the collection is evidence that Wood was deeply moved by the beauty of nature, and it may well be through his friendship with artists, such as that with the painter James Eckford Lauder (1811-1869) (whose elder brother Robert Scott Lauder (1803-1869) was a friend and colleague of D.O. Hill) that the clue to the context of his photography may be found. Wood’s diary records a visit to the West of Scotland in 1841 in Lauder’s company in which for the first time he shows an interest in the landscape as ‘fine’, a ‘good sample of the dismal’ and ‘more picturesque than the Trossachs’. Enigmatic though much of his work may appear today, its quality is unmistakable; we look forward with interest to Miss Stevenson’s promised exhibition and catalogue within the next few years4. The works by John Muir Wood that were acquired by the National Galleries of Scotland can be viewed online. 1. Sara Stevenson ‘The progress of the Scottish National Portrait Gallery’s Collection’ Scottish Photography Bulletin (Autumn 1986), p. 16. Some of this article is based on A.D. Morrison-Low, ‘Scottish Photographers abroad during the nineteenth century’ in Jenni Calder (ed. )The Enterprising Scot: Scottish Adventure and Achievement (Edinburgh, 1986), p. 154. 2. Much of the information contained here is taken from research supplied by a descendant of Wood, Mr Paul Muir Wood, which besides using manuscript letters and a diary, was supplemented by entries from the Dictionary of National Biography, Grove’s Dictionary of Music and Musicians, ‘Mr J. Muir Wood’ in The Musical Herald, 1 August 1892, C. Humphries and W.C. Smith, Music Publishing in the British Isles (London, 1954), and R.E.M. Harding, The Piano-Forte (London, 1978). 3. Jams Coppens, ‘George Moir en John Muir Wood’, Foto June 1985. 4. 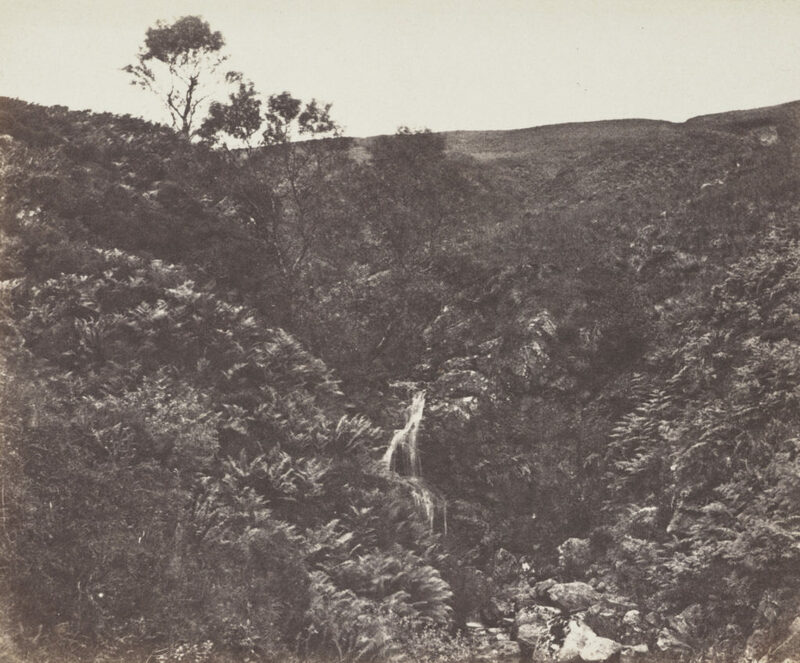 An exhibition was held at the Scottish National Portrait Gallery in 1988 and was accompanied by the publication The Photography of John Muir Wood 1805-1892: An Accomplished Amateur with text by Sara Stevenson, Julie Lawson and Michael Gray.